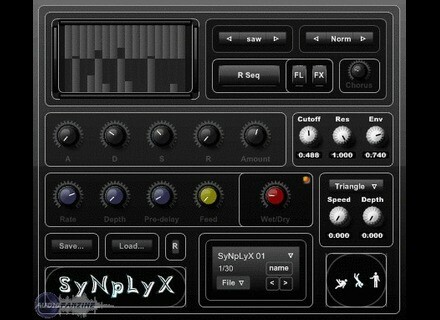 SyNpLyX, Other Virtual Synth from Tekky Synths. Tekky Synths has announced its new synth VST instruments for Windows SyNpLyX. 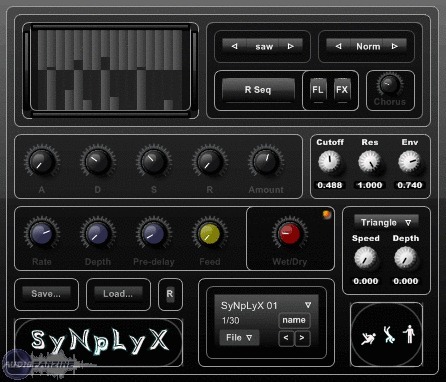 SyNpLyX is a mono synth with a detuned oscillator for a "fat, wide, crisp and deep sound." 1x Manual Draw Mode sequencer with save, load and random (sequences are compatible with PsYbAsSyX, sYnYx and SyNpLyX). 1x Detuned Osc with multi-waveforms (Sine, Triangle, Saw, Square). 1x filter section (cutoff, res and env). 1x LFO for filter modulation with multi-waveforms (Sine, Saw, Triangle, Square, Noise). 1x preset manager with 32 presets. Full MIDI learn on every parameters. They cost €30 each. A demo version is available. 112db Redline Monitor Update 112dB has announced that Redline Monitor, the near-field monitor simulation for headphones, has been updated to version 1.0.1. Loopmasters Drumdrops In Dub 2 Pack 3 Loopmasters has released Drumdrops In Dub 2 Pack 3, featuring Horseman. Tekky Synths WavDrYx Tekky Synths has announced the release of anew synth VST instrument for Windows: WavDrYx.